What a career Bing Crosby had. Is there anyone in popular culture who got his start in the 1920s who is as well remembered today as Der Bingle? Many folks 55 years old and younger will recall only the more sedate, older Bing, he of the briarwood pipes, stingy-brimmed fedoras, and cardigan sweaters. But in his early years, Bing was like Elvis Presley—a white man singing music inspired and influenced by the music of the African-American community. He also was something of a wild man off-stage, as he is said to have had, in those days, a penchant for going on alcohol-fueled tears. By the time this profile was published in December 1935, Bing was long since a huge star, having conquered vaudeville, recordings, radio and movies. He had much great success still to come, but it’s interesting to consider this early look back at his rise to stardom. Bing Crosby will tell you that he is the laziest man in the United States, but it is doubtful if a more ambitious and energetic person ever fought his way to the pinnacles of success. A lazy man would have been content to do one thing. Bing, however, achieve his fame by doing well in half a dozen diversified fields of endeavor. As a youngster, he was a star athlete. Growing up, he made himself an expert musician and a polished orchestra leader. Later came his success as a crooner and as the greatest entertainer in the history of the ether waves. He followed this triumph with a thrilling and novel courtship of the sweet and beautiful cinema queen, Dixie Lee. Shortly afterwards, he became the first legitimate radio performer to make a permanent place in motion pictures. Finally, where an ordinary father would have been content with a single son, or even a daughter, Bing proceeded to have twin boys. When the sun disappeared from view on May 2, 1904, a brand-new son brightened the home of the Crosby family in Tacoma, Washington. This newcomer, who is also the hero of our tale, was given the rather pretentious name of Harry Lillis Crosby, Jr. Papa Crosby had to do an awful lot of pickle manufacturing to provide for his seven young ones, so he took the whole caravan to Spokane, where business opportunities seemed brighter. 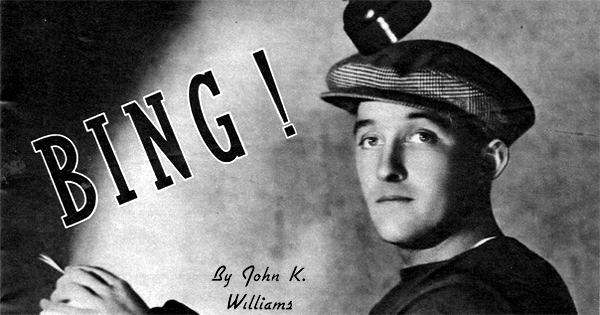 It was in Spokane that the resounding, vocal “Bing!” Bing!” which accompanied the waving of young Harry’s hand-made gun in a game of “cops and robbers,” earned for him the nickname that clings to him to this day. As a boy Bing had no chance to get the habit of being lazy, what with splitting kindling, shoveling snow, mowing lawns, running errands, selling papers, and going to school. He did, however, manage to find time for athletics. He had found visions of himself decked out in a grand uniform and playing shortstop for one of the big league teams. One day, when he was about twelve, he entered every event in a neighborhood swimming meet and wound up with nine first place medal, and two seconds. Bing received his baptism of grease paint while attending Gonzaga High School in Spokane. One night, playing a dead Caesar, he turned a tragedy into a comedy by leaping upstage to dodge the falling curtain. After school he worked in the prop department of a local theatre, and broadened his knowledge of life behind the footlights. Finding that he still had a few minutes of leisure each day, Bing began to deal out punishment to the drums in the school orchestra. The summer that he was sixteen he became a lumberjack in a relative’s logging camp, and in this capacity did more damage to his own person than he did to the forest. Bad cuts above each knee forced him to retire. That fall he entered Gonzaga University with the idea of becoming a lawyer, but football, baseball and the glee club received most of his attention and efforts. The average person would have found it hard to keep up with such a schedule. Together with a classmate, he organized a seven-piece band that was soon a necessary part of all the college parties. Bing played the traps and sang the vocals. The manager of a vaudeville house heard the band, liked it and engaged it for an indefinite engagement at his theatre. This settled, once and for all, the profession Bing was going to follow. He and Al Rinker, his school chum, went to Los Angeles, where Rinker’s sister, Mildred Bailey, secured them employment in the Tent Café. After that they toured the Pacific Coast in vaudeville. In three years with Whiteman their voices became known from coast to coast. In 1930 the trio was signed to sing at the Cocoanut Grove. It was here that Crosby began to make a name for himself as a soloist. He made records which became best-sellers. About this time Bing was introduced to Dixie Lee and from that moment, he knew that there was only one girl for him. They had frequent quarrels and she would vow that she’d never see him again, but Bing’s ability as a crooner manager to patch up all of their little disputes. His signing with the Columbia Broadcasting Company made history. Within a very short time his voice had made him the most popular figure in radio. He was given a part in the motion picture, “The Big Broadcast,” and aroused such favorable comment that Paramount signed him to appear in feature pictures. His success in Hollywood came as swiftly and was just as astonishing as it had been on the radio. He was starred in “College Humor,” “Too Much Harmony,” “Going Hollywood,” “We’re Not Dressing,” “She Loves Me Not,” “Here Is My Heart,” “Mississippi,” “Two For Tonight,” and “Anything Goes.” His name ranked seventh in drawing power among all the screen stars, according to the annual “Box-Office Check-Up” for 1933-34. Bing will never forget the 13th of July, 1934, because that is the day his celebrated twins were ushered into the world. To add to the misery of the nervous, expectant father was the fact that the calendar read, “Friday, the 13th.” The two tots are called Philip Lang and Dennis Michael—and often vice versa. Another son, Gary Evan, is a year older. He is looking forward to two things that he has missed doing in his varied life. One is to take a trip around the world, and other, strange enough, is to write short stories.